A quality product that will positively surprise you. The delicious nut mix provides a solid bite and a unique taste experience. The burger is also delicious on a bun. 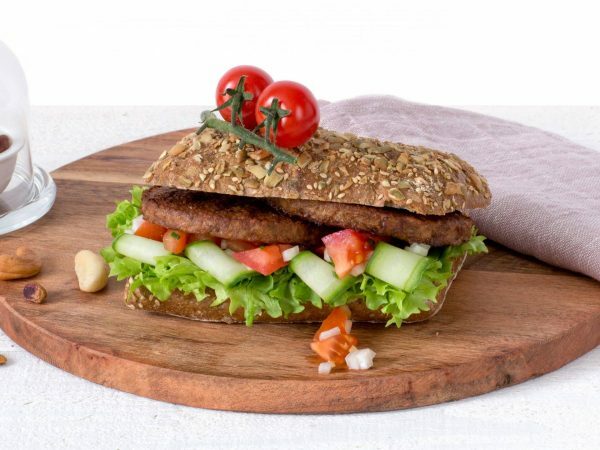 This vegetarian Nut Burger weighs 60 grams. Water, 31% mixed nuts (cashew nuts, brazil nuts, almonds, macadamia nuts, pistachios, pecans), 9% vegetable protein (soy, wheat gluten), egg white*, starch (potato, wheat, corn), dextrose, natural flavouring, sunflower oil, garlic, salt, spices, mineral (ferrous fumarate), vitamin B12. * free-range eggs. Produced in a facility that processes peanuts. Frying pan : 4-6 minutes on moderate heat. Turn every now and then. Oven : 5-7 minutes at 180°C. Turn once. Microwave : 1 min. at 900W.